Last year, Sarah Nelson, in a series of articles, gave us an insight into running an allotment. Now, with winter and a hard frost recently covering the allotment, Sarah takes up painting…….. Walking the dog around the nature reserve I am always struck by the painterly environment in which we wander. For some months now I have been planning to capture the essence of this on canvas. The trouble was, I hadn’t done any proper painting for years and was in need of direction. Nick Archer, trained at the Royal Academy, is a local artist, whose studio is at the Rye Creative Centre. Nick was to run a series of weekly classes focusing on oil painting, so I signed up. Arriving at the art room that first afternoon was comfortingly familiar. It had been a while since I was last surrounded by easels, but here they were, standing tall alongside stacks of drawing boards, an enormous drying rack, tape markers dotting the floor and an old butler’s sink in the corner. A dozen of us made up this group, some were established artists, with studios in the building, others like me, used to paint but were out of practice and needed a class to get us going again. Nick explained how to lay out a palette. Squeeze cool colours along the top and warm down the side, then mix as required with a palette knife. Not owning a palette knife I had pinched one from my son’s art kit, which Nick then borrowed to use in demonstration, it promptly snapped! He looked sheepish, apologised and used someone else’s. Luckily, I happened to have some plastic plant labels with me and started mixing my paint with these, which horrified Nick who left the room and returned with a brand new one, which happily am still using. Wanting to explore techniques for painting sky and water, I had brought along some photographs I’d taken of high water at Rye Harbour. Colour mixing was, and remains, my biggest challenge. Tiny amounts of the wrong one can ruin a colour and waste a lot of paint. Nick’s palette was the size of a dinner table, mine a plate, which struggled to contain the paint and ended up in a mess until I got something bigger. We were encouraged to experiment with ways of applying the paint other than just by brush. Heavily diluted inks and watercolour poured onto paper was an effective way of replicating high tide. The same method with oil paint didn’t translate so well but using a squidgy, and scraping on the paint in swathes helped capture the feel of a body of still water. The thing about producing a painting is that you don’t really know how it’s going to turn out, as you can’t necessarily control all the elements, a bit like growing vegetables really. Some classes went well, and I felt positive about my efforts and others were a struggle and unable to achieve what I had in mind, I’d overwork it and feel miserable. I guess this struggle is at the heart of each painting we look at and admire and in the end it’s what makes it work for us or not. 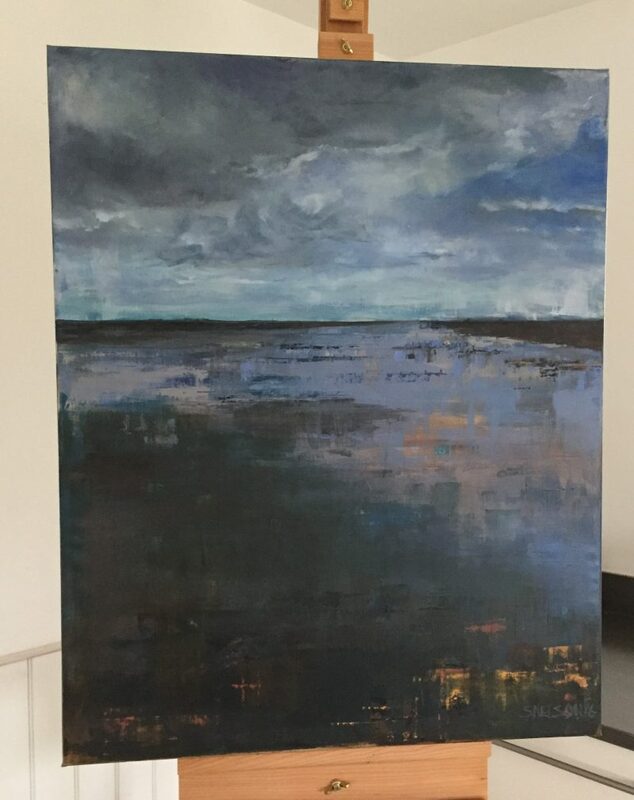 Encouraged by the results of High Water, I have since painted a few figurative works and am now stretching up canvases ready for more landscapes. The down side to painting is all the kit that goes with it. 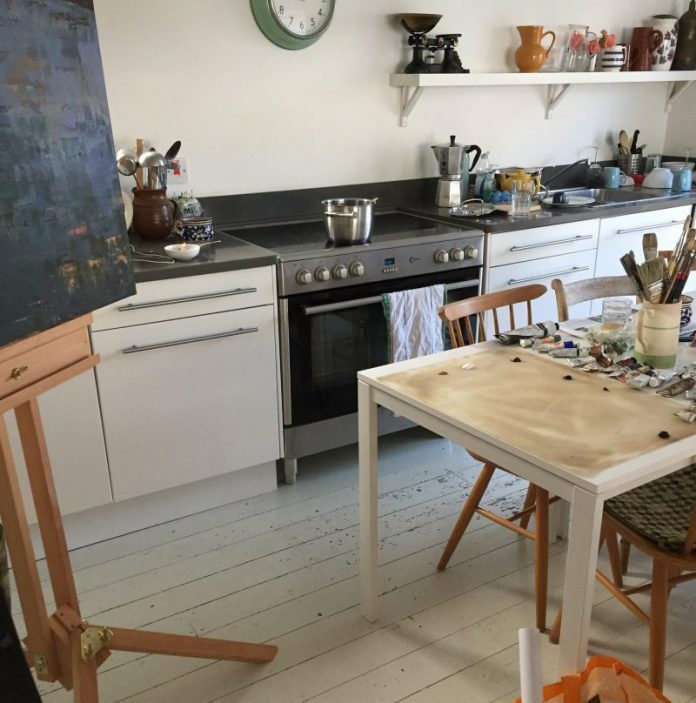 Easels, canvases and bags of paint paraphernalia are now distributed throughout our little house and oily turpentine scents the air, but I am smitten and now reconnected with painting, starting to think that I might need a studio too…. ooh and maybe a gallery to hang all the results?